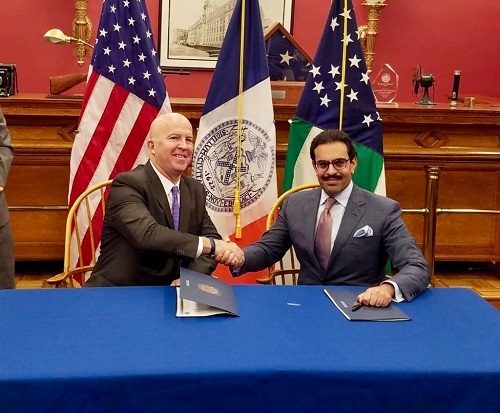 The Ambassador of the Kingdom of Bahrain to the United States of America, Shaikh Abdullah bin Rashid Al Khalifa, and the Police Commissioner of New York City, James O'Neill signed a memorandum of understanding as part of the joint efforts of the two countries to strengthen cooperation in combating transnational crimes. The Memorandum of Understanding includes the development of cooperation in the field of crime prevention in general, and international terrorism in particular, including countering all forms of supporting, funding and inciting terrorism, as well as combating trafficking in persons, illicit trafficking in drugs, narcotic drugs and psychotropic substances as well as maritime fraud. The MoU signed between the two countries also includes cyber and economic crimes, in addition to money laundering crimes. 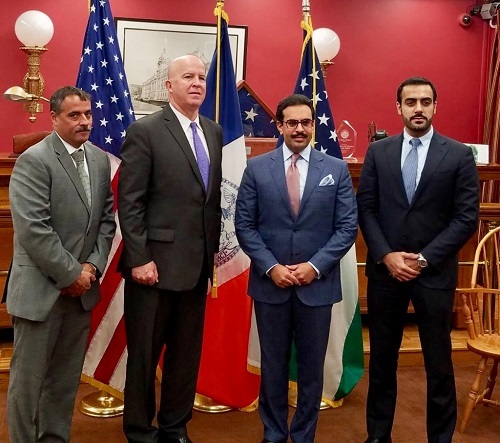 The Ambassador of the Kingdom of Bahrain to the United States stressed the importance of strengthening cooperation between the two countries in all fields, achieving the greatest cooperation in the security fields and contributing to combating crimes in all their forms. He also explained that the signing of this MoU contributes to enhancing coordination in addressing threats to security. The signing of the Memorandum of Understanding was in the presence of Capt. Hamad Khalil Al Meer, from the Defense Attaché at the Embassy of the Kingdom of Bahrain in Washington.